Here is the third and final part of the talk we have presenting over the last weeks. 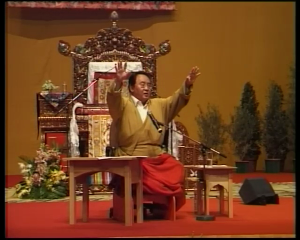 On the occasion of the visit of His Holiness the Dalai Lama to Paris in October 2003, Sogyal Rinpoche gave this memorable talk on the Tibetan Buddhist understanding of life and and death to an audience of over 3,000 people. In part three of this talk, Rinpoche explains how the life we lead determines how we will face death, and he gives precious advice for the moment of death from the great Buddhist master Padmasambhava. You can find parts one and two of this talk here. This talk is also available as an audio podcast which you can find on our Audio page.